CBF ™ (Cascade Blocking Formula) provides a safer, clinically tested option for effective joint relief. This proprietary combination of selected plant components influences the formation of certain substances, such as PGE2, that are associated with minor pain. 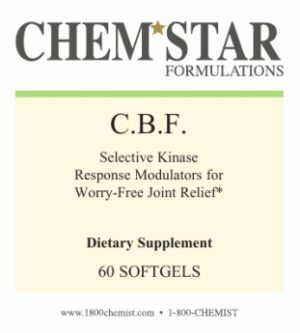 Clinical testing suggests that C.B.F.TM may offer a high degree of predicted cardiovascular, gastric, renal and liver safety. Suggested adult dosage: one tablet, three times daily.